Since 2013, the Appalachian Theatre of the High Country has been working closely with Clearscapes, an architectural firm based in Raleigh, NC, to design a modern theater facility that preserves the original exterior appearance of the 1938 Appalachian Theatre and pays homage to the 1938 theater's history in its redesigned interior. Completion of the main facade reconstruction, which closely replicates the original 1938 appearance, was completed in 2017. Work on the interior reconstruction is slated to begin in Spring 2018, with an estimated completion date in Summer 2019. The plans below are the latest construction drawings for this interior work. Click on the "Learn More" button for each view to see the full drawing as a PDF. The redesigned theater interior will include the main performance space, an expansion of the original stage house, the original auditorium floor, the original balcony, and a redesign of former office space facing West King Street into a community room that will accommodate meetings, receptions, and smaller performances that do not require the main stage. The renovated auditorium will include a larger stage, a new set wing, an orchestra pit, and modern house mix and control board positions, while undesirable seats under the balcony have been eliminated. 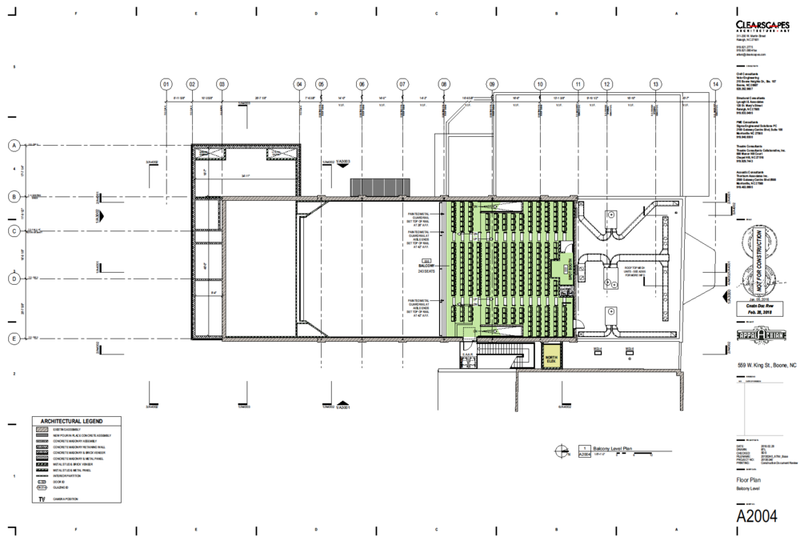 The first floor also includes modern, expanded restroom facilities, a spacious lobby with interior will call and box office windows, and a large concessions area with bar service. 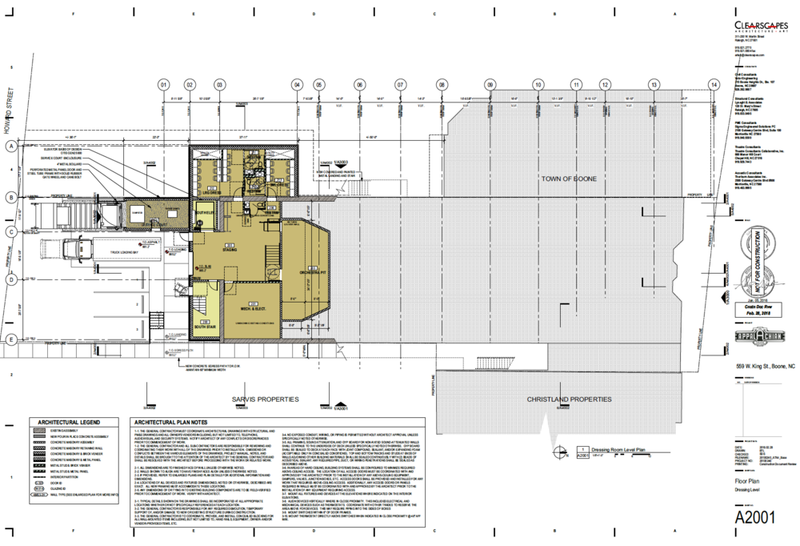 An elevator will provide access to the community room level. The former doctor's offices of the second floor north part of the building will be transformed into a large community room with a catering prep area. This community room will be an ideal space for large meetings, conferences, wedding receptions, and smaller performances. 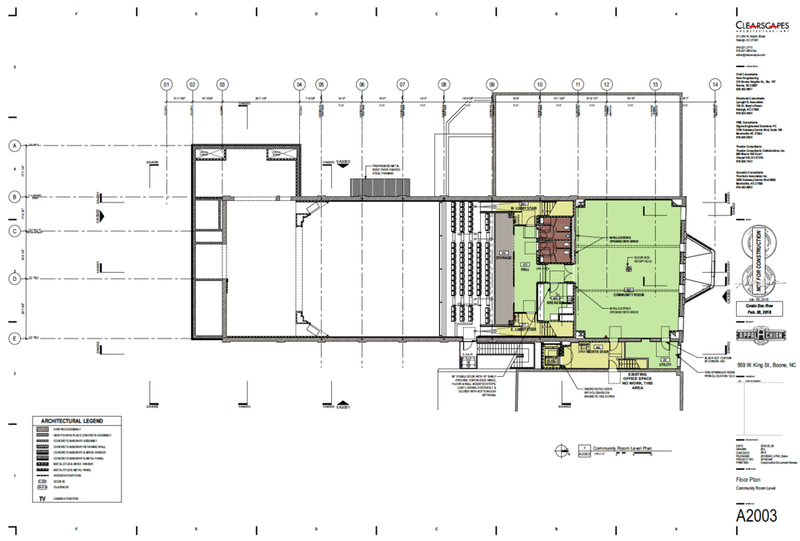 The community room will be ADA-accessible via an elevator in the east hallway. The balcony of the original Appalachian Theatre was somewhat remarkable for its outstanding sight lines, and the renovated theater will preserve this feature. The former projection booth at the rear of the balcony will also be reduced in size to provide a follow-spot booth. The original Appalachian Theatre stage house was notoriously cramped. To compensate for this and accommodate modern performances, the existing stage house will be expanded to include a freight elevator, loading dock, and staircase to the south, a set design wing on the auditorium level to the west side of the building, and dressing rooms below the set design wing.